Interested in taking a closer look at NOMA’s collections? Want to take a deep dive into a focused art topic? Join NOMA curators, staff and other art professionals as they explore a variety of topics in our Art Primer series. 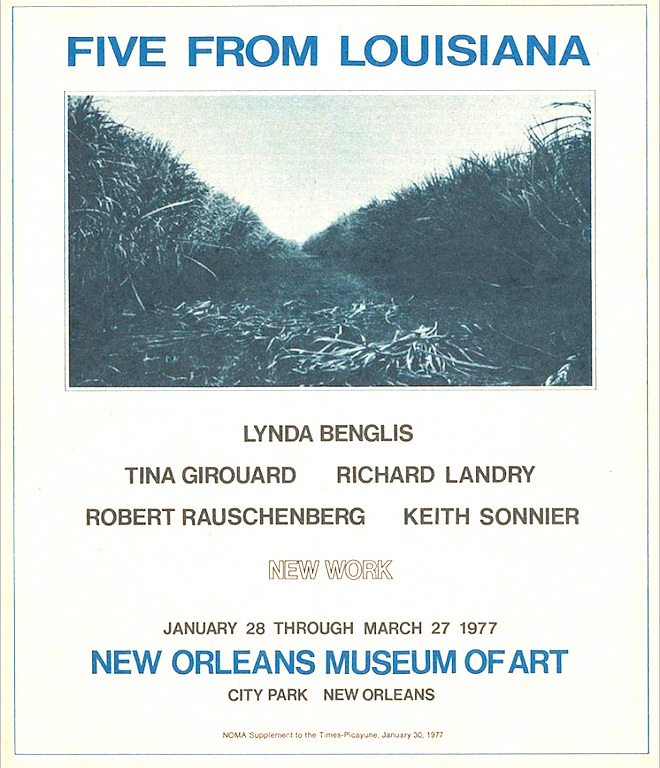 In conjunction with the exhibition Keith Sonnier: Until Today and Tina Giroaurd’s beaded Vodou flags, on view in Bondye: Between and Beyond, this Art Primer class will focus on the landmark 1977 NOMA exhibition Five from Louisiana, which featured work by five Louisiana artists who had gained international prominence: Robert Rauschenberg, Lynda Benglis, Tina Girouard, Richard “Dickie” Landry, and Keith Sonnier. Led by Katie Pfohl, Curator of Modern and Contemporary Art, and Allison Young, Andrew W. Mellon Foundation Fellow for Modern and Contemporary Art, the discussion is free with museum admission. Admission is free to all Louisiana residents on Wednesdays courtesy of The Helis Foundation.